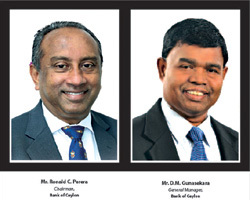 Bank of Ceylon scored its third ‘trillion’ at the end of 2016 – i.e. surpassing the Rs. 1 trillion mark in advances, another unique milestone in its 77-year journey as ‘The Bankers to the Nation,’ making it the first, and up to now the only, bank to surpass this milestone in Sri Lanka. The bank’s balance sheet expanded at an impressive scale since its first ‘trillion’ target was achieved in 2012 by accumulating over Rs. 1 trillion in assets in the bank’s balance sheet, becoming the first business entity in the country to do so. Then by 2015, the bank announced its second ‘trillion’– Rs. 1 trillion in deposits.